Storefront for Art and Architecture presented Manifesto Series: DRAW-THINK-TANK: Emerging Territories of Movement 15×360 manifestos at the Festival of Ideas for The New City on Saturday, May 7th, 2011 from 4 to 7pm in New York City in collaboration with Audi Urban Future Initiative. The event took place inside the mobile space structure designed by the German group Raumlabor: the Spacebuster. For the Festival of Ideas, Spacebuster was situated at the intersection of Houston Street and the Sara D Roosevelt Park within the StreetFest. 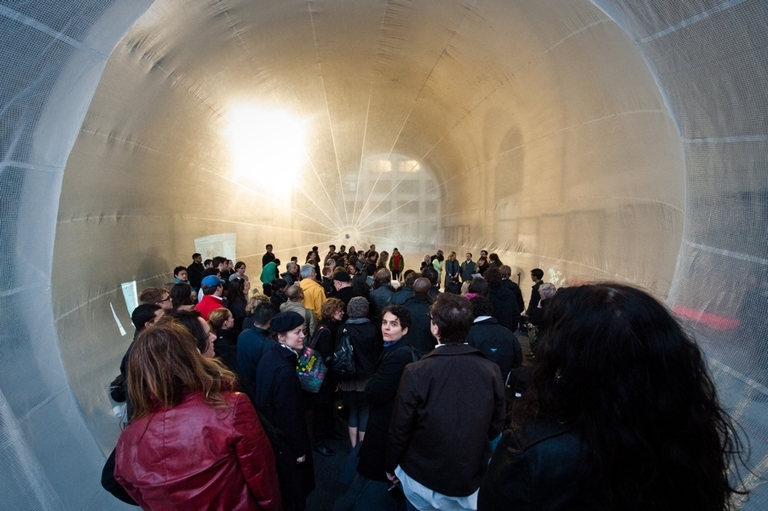 For the event inside the Spacebuster, manifestos were live staged by a group of 15 individuals consisting of architects, engineers, writers, sociologists, anthropologists, philosophers and other relevant and emerging figures, each followed by a short discussion. 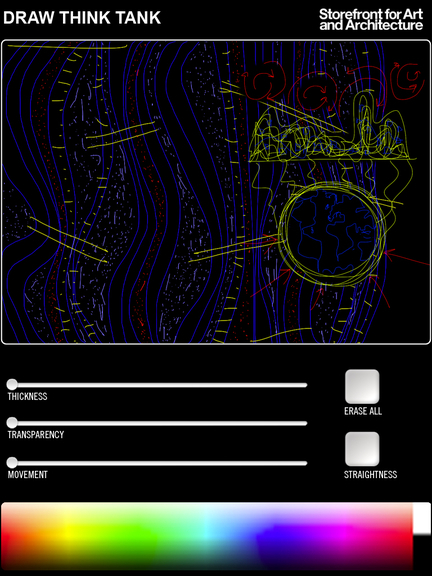 Simultaneously, and in order to foster creativity and reflection, an innovative platform called Draw-Think-Tank, a Storefront iPad platform designed especially for this event with artist Joshue Ott, allowed the participants and a chosen group of students of architecture to collaborate in the construction of a collective drawing projected on the walls of the Spacebuster to expose into the public arena their ideas in a space of synergy and cross collaboration. 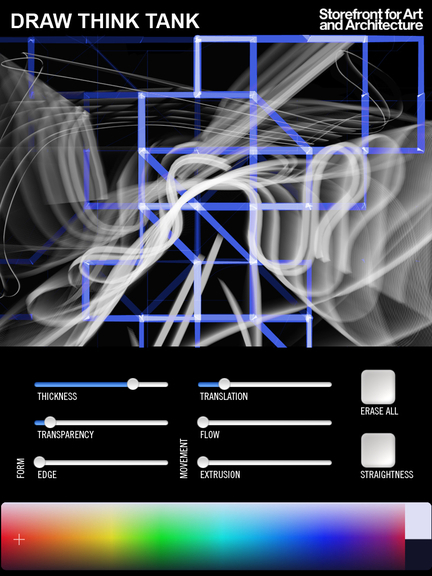 The mutating drawing was printed out throughout the event as a series of 360 unique instant manifestos. The event was structured in three sessions of 1 hour each where a curated multidisciplinary group individuals presented a a manifesto of four minutes: 7 points and 7 images. This event aimed to interrogate the current situation of mobility in relation to its past and present challenges, while attempting to provide a space of discourse for its future implications. The event was free and open to the public. 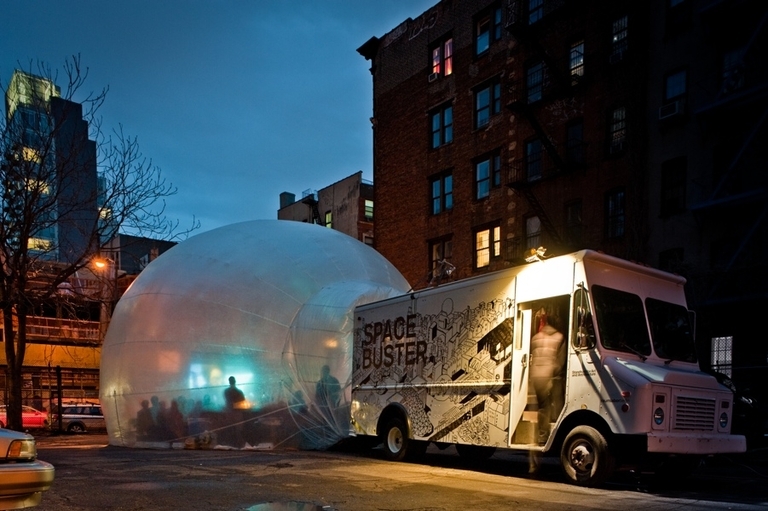 Space within the Spacebuster is limited, and made its next appearance in New York at Ideas City 2013.